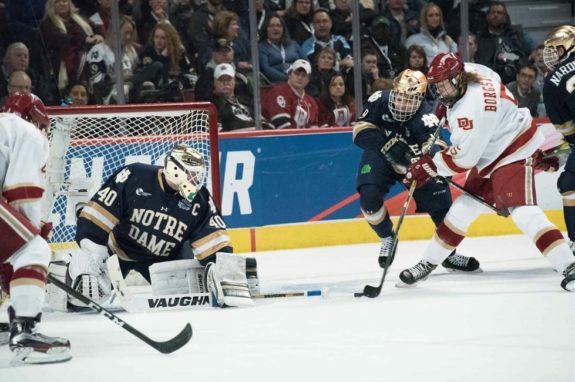 College hockey returns this weekend for the final time this season as the 2019 Frozen Four comes to a climax in Buffalo, N.Y. After a wild opening weekend to the NCAA tournament when two out of the four No. 1 seeds were upset in the first round, only four teams remain: Denver, Massachusetts, Providence, and Minnesota-Duluth. The match-up between Massachusetts and Denver promises to be a grind. Both teams reached the semi-final having not allowed a single goal in the tournament so far. Both teams are riding a hot streak of freshmen netminders. And both teams have been proving people wrong all year. For the University of Massachusetts, this weekend marks the opportunity to put the cherry on top of a dream season. The Minutemen, who won just five games two seasons ago, weren’t even ranked to begin the regular season (they received just 35 votes). Since then, they’ve won 30 out of 39 games, claiming the Hockey East regular season title for the first time in program history. This weekend is also a historic one for the Minutemen, who are making their first ever Frozen Four appearance in just their second NCAA tournament. The biggest name of the season for the Minutemen has been Cale Makar, a Hobey Baker finalist who netted 48 points from the blue line. Lately, though, it has been freshman goaltender Filip Lindberg stealing the spotlight. Ever since Lindberg replaced Massachusetts’ regular starter, Matt Murray, in the first game of the Hockey East Quarterfinals, the 20-year-old netminder has been lights out. In five postseason games, Lindberg has given up just three goals on 93 shots (.968 save percentage), earning a 4-1 record that includes three shutouts. After bowing out of the Hockey East tournament to a lesser Boston College squad, the Minutemen have bounced back with some strong play to open the NCAA tournament. Massachusetts won both of its first two tournament games in convincing fashion, defeating both Harvard and last year’s runner up, Notre Dame, by a 4-0 margin. Their explosive offense, which stars Makar but goes much deeper, has been locked in so far in the tournament. Head coach Greg Carvel doesn’t think that’s a coincidence after their dissapointing loss to Boston College. Massachusetts may not have the experience that some other perennial contenders have, but they’ve held up well against the pressure thus far. Speaking of perennial contenders… In a year when many traditional college hockey powerhouses have faltered, the Pioneers are right back in the hunt for the national championship. That being said, Denver’s twelfth-straight tournament appearance was anything but promised coming into the season. Denver lost their head coach, Jim Montgomery, to the Dallas Stars before the season. They opted to bring in 28-year-old David Carle, who had no head coaching experience, to replace him. They also lost three of their top players from last season, who opted to leave early for the NHL. The writing on the wall was a regression for Denver, an eight-time national champion that has reached the Frozen Four 16 times. Suffice it to say, the writing was wrong. Instead, Denver has rallied around the “prove them wrong” mentality (they had t-shirts printed with the phrase), and now sit two wins away from tying Michigan’s record of nine national titles. Denver’s defense has been its best asset throughout the season. They’ve allowed just four goals in six playoff games and held both Ohio State and American Internation scoreless in the NCAA tournament, winning 2-0 and 3-0, respectively. But much like Massachusetts, it’s a freshman goaltender who has stolen the spotlight. Filip Larsson, a sixth-round pick by the Detroit Red Wings, has been outstanding between the pipes for the Pioneers. He’s posted back-to-back shutouts to kick off the tournament, turning away all 50 shots he’s faced. In a way, Larsson’s story has encapsulated the Pioneers’ “prove them wrong” mentality. The 20-year-old netminder missed nearly nine months of hockey after sustaining an injury in February of last year. He’s bounced back with a .935 save percentage and 1.87 goals-against average and is playing his best hockey of the season. What happens when an unstoppable force meets an immovable object? Well, something’s got to give. When Massachusetts and Denver clash on Thursday, someone is going to have to score, meaning that one of these shutout streaks is coming to an end. As far as match-ups go, it seems like the Minutemen and Pioneers were destined to play each other. Massachusetts has a deep and dangerous offense that will test Denver’s lock-down defense. Meanwhile, both teams feature freshmen goaltenders who have been unreal in the postseason. Denver is certainly the more experienced program (even if their head coach is new to the ship), this is their third Frozen Four appearance in four years. But experience hasn’t been much of an issue for Massachusetts, save for the Hockey East tournament loss, which the Minutemen have bounced back from looking like seasoned veterans. I’d expect a tight battle between the two, and I wouldn’t be surprised if it comes down to the wire (overtime is a real possibility for this one). In the end though, I think the match-up is tipped ever-so-slightly in Massachusetts’ favor. Both teams have been air-tight defensively in the tournament, so this game should be all about who can break through. At the end of the day, the Minutemen look more poised to do that. Yes, there’s Makar and his Hobey Baker-worthy season, but the buck doesn’t stop there. The Minutemen roll four lines deep, and every line is capable of producing. Additionally, Massachusetts has the upper hand in special teams play. Their second-ranked power play is much stronger than Denver’s, which ranked No. 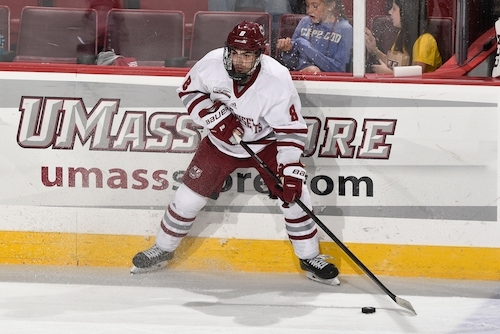 48 in the nation, while the Minutemen’s fourth-ranked penalty kill ranks above the Pioneers’ No. 20 penalty kill. In a game that will likely be a low-scoring, 60-minute (or more) grind, Massachusetts will be able to wear down Denver’s defense and lock in their first national championship appearance in program history.